Successful content writing gives life to your words. This is what strikes a chord with your intended audience, and engages them. This is not achievable without extensive research done before jolting your findings down on electronic paper. This is additional post for our main blog post: How to get 403,196 Pageviews Per Month. So how do you carry out in-depth topic research for your blog posts? Google does not only rule the search engine world, it rules minds in the digital age. You are writing to a population hopelessly dependent on Google, and the big G rewards those who in turn supply it with great content. To achieve a higher position on Google, you have to provide a researched content. Businesses should avoid creating blogs for creation’s sake and rather create content that converts to traffic; Content that seduces Google to turn its big all seeing eye on you and in return reward you with higher rankings and traffic. Your search engine optimization (SEO) or sales goals are highly dependent on the concept, strategy, and rationale that fuel your words. Once these are in place, your content will organically rank high on Google searches because it has specific keywords that are in demand. The searchers will, in turn, share your content more on social media, leading to an explosion of traffic on your content platforms. Now that we have your goals in sight; seduce Google to rank your content well organically and as a consequence have content that goes viral, all you need is your internet connection and gizmo to begin your research. This is a technique marketing departments all over the world use to encourage their workers to gather the energies into a “storm” and transform these energies into words or diagrams that lead to vibrant and lively strategies. What you are required to do is to simply freewrite, letting your thoughts flow freely from your pen or to your electronic gadget, without judging their quality. If you cant think of what to say, write that down too. It will help you free up your internal critic and therefore write less self consciously. This is your exploration phase so be open to all possibilities. Enumerate without evaluating and once the creative storm has passed, you will find a pearl in the debris. Crafty content marketers know that beyond its super search engines faculties, Google is a treasure trove that can aid many marketing strategies. Google’s autosuggest or Autocomplete has been intriguing searchers since 2008, though there was an experimental feature since 2004. As of 2010 it became known as Google Instant, constantly guessing what you are about to say like an annoying friend. The latter uses what Google calls algorithm-based suggestions that are influenced partly by the popularity of a search and what Google refers to as a “freshness layer.” Now think about it, marketing companies have huge budgets for research geared at finding out what people think about a particular product or strategy in real time. Google offers you some of that information, without of course the kind of in-depth analysis a budgeted report would have. To fuel your research on your blog topics, use this feature to figure out what questions your intended audience is asking about your niche. As rudimentary as this keyword search process is, you can use it to know if your idea is completely off base, especially if no one seems to be searching for it. 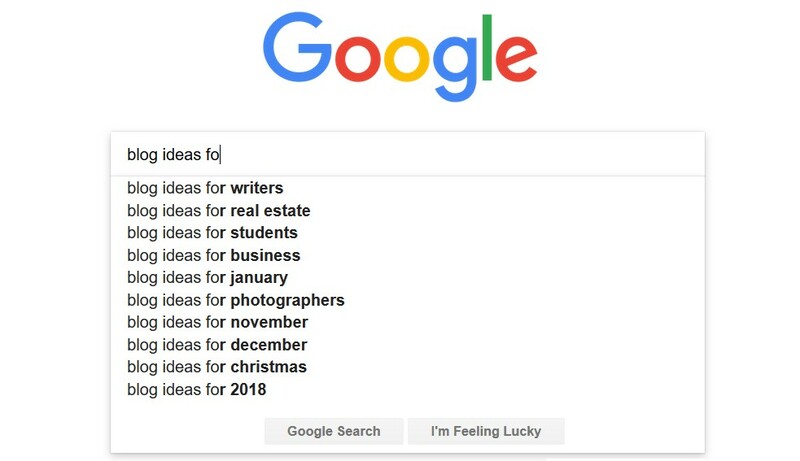 Google’s related searches, located at the bottom of the Google search page, are also another free way to conduct your research. The related searches offer searchers alternative related content that is trending in their scope of the search. This information can offer you additional leads and inspiration for your niche topic because remember, all these searches are from real people with an interest in your topic. Who else can offer you better leads than your intended audience? Your competition attracts the same audience as you do, and if their content is being shared more than yours is, then some good amount of spying should make your content better too. This may offer your content that kick it needs to make it more engaging. A few other factors, like how well Google ranks it and how many links it attracts from other sites can further point you in the general direction you should take with your content. This post is a definitive guide on all you need to know about keyword research, a lengthy topic we are not able to cover on this page. Unfortunately, many commercial bloggers will sit on this knowledge and fail to cover their basics to perform a thorough keyword research when writing. There are many keyword tools that assist you to do this and it’s not rocket science either. If you are trying to engage your readers, cover all your bases; start with good, old-fashioned keyword research. There is an app for everything today, and those that will help you get your awesome title creative juices flowing are out there in plenty. The keyword here is ‘help’, because the software is not intuitive enough to deliver that viral title you long for. With some common sense though and a little insight you can make some awesome lemonade out of what these apps supply, to help you keep inspired and creative. You can have loads of fun with online title generating software such as Answer The Public and Portent’s Content Idea Generator, and who knows, you could find some nuggets amongst the dirt. Is mining ever easy? Whenever the title or topic creates a brainwave, ride that wave further by extensively following the steps outlined in this article, to further polish it. If your competition and the internet are all over a similar idea, then this is your hint that you are on to something big. Measure the relevancy of your gem to your target audience, and check the search volumes delivered, and if it measures up, then ride that car like you stole it, my friend. This is a potential money maker. A house is as good as its foundation, so do not neglect your blog content’s substructure, no matter how hurried, inspired or uninspired you feel. Lifeless content that doesn’t engage your readers and therefore not shared enough online. When its all said and done, the fun is in the journey, not the destination, so enjoy every step to becoming an awesome content creator. Need help with content writing? You tell us what target market you want to reach and some info about your website. Based on the data you have given, we will study your target audience to come up with a viable strategy for your website. We will diligently get you the right topics that are customized to increase traffic to your site. The topics will speak to your target audience. We will send you a sample of the topics so that you can choose your favorites. The articles that we will write are high quality, well researched, SEO-optimized and well formatted. We will also include credible outbound links both internally and externally. We will then send you the draft, and you can send it back for edits till you are 100 percent satisfied. The SEO Optimized blog post is then published on your site.